I have a friend, Sheena....do you read her blog? She wrote about the conflicting nature of Good Touch/Bad Touch Part 1 and Part 2. You really need to read both of those. She has lots of great, thought provoking information going on. 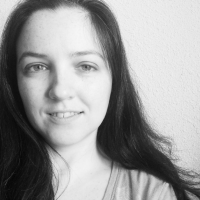 I found myself doing that thing where I start to leave a comment and realize that it is long (even for me, and I have written some pretty long comments!) and I realized that my comment would just have to be it's own posts. Yes, more than one. This is the story of a time when I was really proud of my daughter. Katarina was three years old and we were in line at a Toys R Us. She was sitting in the seat part of the buggy. Behind us in line was an older woman, probably about 55, she was talking with us while we waited. It was the normal standing in line chit chat. She said something like, "Your daughter is so cute. How old is she?" Everyone with kids has had that conversation countless times with strangers. Then she did something else that people seem to think is okay when they meet a baby or small child. She reached out to touch Katarina. Not in a creepy way. I'm pretty sure that she didn't mean anything weird by it. She was going to touch her hand or her hair.....it isn't something that would be considered abusive or sexual at all, but that doesn't make it okay. At this moment, Katarina did the thing that made me proud. She put her hand up in the air and said, "Stop. Don't touch me." The woman was clearly shocked and offended, she let out a snort and a "Well I never....." and stared at me waiting for me to reprimand my daughter. I calmly patted Katarina and whispered, "That was good sweetie" and then told the woman, "She has every right to choose not to let someone touch her." Katarina reacted exactly the way that I would have hoped. She didn't freak out. She calmly and assertively informed this woman of her boundaries. I loved it! You might be wondering how it is that she knew to react this way. Maybe you aren't, but I am going to tell you anyway! Thomas and I started teaching her when she was little. We never once told her to hug or kiss a family friend or relative. We always asked before we kissed or hugged her. Doing this modeled to her that she has the choice to whether or not she wants to let someone into her personal space. Anytime a family member said, "Come give me a hug", I would say, "You may hug her if you want, but you don't have to". I was quickly labeled THAT MOM...you know the one with all the "new ideas about child rearing" I'm sure there were probably less flattering labels put on me when I wasn't around. But I didn't care. It was more important for my daughter to know that she wasn't required to touch or be touched if she didn't want to. Katarina loves to wrestle around, have tickle fights, and jump up and down on us parents. Normal kid fun, but the moment that she says stop, we do. And it goes the other way too, when I am done getting tickled or jumped on, I say stop. She does. There is never a need to say "no more" twice. When someone is done with tickles or hugs or games, it immediately stops. The night after the incident with the lady at the store, I was telling a friend about what had happened. Another woman overheard us talking and couldn't resist jumping in. She told me that I had better get a handle on that sassyness. It might be cute now that she is three, but when she gets older and smarts off to adults it won't be cute anymore. Katarina needed to learn to respect adults and be polite. Normally this type of interference would have made me angry or at the least annoyed, but this time I was sad. I thought about this woman and the two precious daughters that she had, and I realized that it was more important to her that her children be well behaved...that they be polite to adults, than it was for her daughters to have a say over their own body and personal space. I also really feel the need to clarify something here, something that my friend never could be made to understand....Katarina didn't say anything disrespectful to that woman. She didn't sass her. She stood up for herself and told her no. This is the lesson that we should all want our daughters and our sons to learn. If they can't tell an adult stranger not to touch their hand, how can we expect them to tell an adult that they do know, an adult that may be in charge, not to touch their private areas. If we squelch their voices, how do we expect them to speak out if someone makes them do something that they don't want to do. As Katarina has gotten older I have given her more instructions about how she can use her voice. When she is going to a class, or Sunday School, I tell her this, "I expect you to do the right thing, but remember that the teacher could be a crazy person and you don't have to obey the teacher." Who tells their kids that? Isn't that a recipe for a bratty, awful kid? No. It isn't. I have never once gotten a bad report from a teacher or leader about her behavior. (I have also never told her to go to bed and gotten a "no" from her-she has a firm understanding of rules) She understands that doing the right thing means being respectful and obeying the rules. But she also knows that if a teacher or coach or other kid tells her to do something that makes her uncomfortable, she can say NO and I will back her up. If they tell her to do something that involves her private area, or another person's private area, or taking clothes off, or touching without taking clothes off...or anything that she doesn't want to be involved in, she can say, "I will not do that." and if the teacher threatens to call me or tell me that she didn't behave, she can say, "please call her now"...and she will never, ever get in trouble for doing that. Some family members heard me going over this talk (we discuss it every time she is going to visit a Sunday School or be with adults that are new. We discuss it even with adults that she sees all the time) and they told me I was crazy. "No one there is going to tell her to do anything wrong. You can't let her decide what directions she will or won't obey." I told them that I would never tell my daughter to obey everything that someone else tells her to do. I understand that no matter how prepared Katarina is, an abuser could still do something to her. Ultimately it is my responsibility to protect her, but I can't be there every second. I also know that self-assured, assertive children are less likely to become prey for abusers. Nothing is fool proof. You can't prepare for every possible situation, and no matter how careful and cautious you are it is still possible for a predator to come into your life and try to prey on your child....but that is no excuse for laziness. Prepare for the things that you can and go over those preparations again and again! Give your children a voice. Show them that it is valid by listening to it. Oh yeah, I also told her that if the calm respectful "no" doesn't work....then she can scream and kick and hit and bite and yell until help comes. It is her body and her personal space and no one has a right to it if she doesn't want them to. By far this isn't the only preparations that Thomas and I have made with Katarina or the only discussions we have had on this topic, but it is the story that came to mind when I read Sheena's post. It is a start and a foundation. We build on that foundation with repeated viewings of Safe Side Super Chick and lots and lots of conversations, mock confrontations, questions and answers. These preparations grow in depth the older Katarina gets. What about you? Do you teach your kids to say no? Have you even thought about it? .....or do you think I'm crazy? Let's have a conversation of our own about this! Such a fabulous post. She is going to know how to stand up for herself. I would make sure to clarify what she is allowed to say "no" to her teachers about, though, and make sure that she knows that she can't say no just b/c she doesn't like what she's being told to do. I know you said there hasn't been an issue yet, but I would talk about examples of when it's okay to say no and when it's not. Or at least explain the things that aren't optional. You are totally correct on that Shell. I should have clarified.... We have had that conversation about what rules she is expected to obey! ex. "What if you don't want to sit in the seat while the teacher does the lesson, can you say no to that?" She has a good understanding of what is expected as far as rules are concerned. I teach my kids the same exact way. It really irks me that a stranger thinks it's OK to touch my children. When Ethan was a baby, my cousin and I were in a nail salon. She was holding Ethan while I was finishing with my appointment. One of the employees came up to her and ahhed over Ethan for a bit and went back to her client. After her client left, she came back up to Ethan and tried to take him out of my cousins hands. I was out of my chair so fast you'd think I was on fire. I told her that while my baby didn't have a voice yet, I did, and that she did not have my permission to get into my child's personal space and take him from someone I trusted. She looked at me like I had two heads and told me I was being rude. I told her I was in no way being rude, that I had a right to choose who could and who could not hold my baby, and she most certainly could not. I'm the same way with Claire and Grayson. Claire will tell people no if they try and touch her. No one has tried to touch Grayson except for his doctor, but if they did, I'd be all over it. This might be my longest comment yet, ever! :-D I love what you're doing. I have always told The Husband and my FIL that if they're playing around the little ones, when they say STOP or NO, they need to STOP. Immediately. If one of the girls starts the play up again, that's fine, but when they say STOP... STOP! They need to know that their words carry the authority with anyone. Also, I do the same thing -- they don't have to hug anyone if they don't want to. They don't have to like every adult just because it's someone from church. As a matter of fact, if my girls just don't feel right with an adult, *I* pay attention. I think you're wise. I know I don't keep my girls 'bubbled' as much as some of my friends, but I also am aware of what kind of world we're living in, and while kids are KIDS and not miniature adults, they need to know that their personal space IS their personal space, and their bodies are not public property. We've taught our kids the same. Six of our kids are adopted, most were taken from their prevopus homes and I've been scared to death that someone would track them down and try to get the kid(s) to go with them. Also they've been taught to go with their gut and call mom if anything seems weird. Kids need to be taught to be leaders, not sheep. Most people refuse to accept that most abusers and family and friends. I was always vocal about not forcing myself on children (as in hugging) or making my daughter give or receive hugs. All people (I'd like to hear boys are receiving the same education) should be taught their personal space rights. Adults must respect children that is how you get their respect. Such an amazing post. I love (and completely agree) with all of the points you made. It is SO important to teach our children these critical life lessons when they are young! I absolutely love this post. I love that your daughter uses her voice. I am glad that you are "that" mom...the mom that empowers your daughter. If only there were more of "those" kinds of parents. It seems so small, urging your children to hug an adult who's just being nice. But the insistence that a child must be physical on any level with someone that they do not want to be...gives room for ANY one to take advantage of them. We should never insist that a child allow someone to touch them if they do not want to. Even if its an innocent touch. If its unwanted, then its not innocent. Just saying. I always told my sons that they were the boss of their own bodies and that most people in the world were nice and helpful but a few were not. I never forced them to hug or kiss a relative but they never seemed to mind a gentle or loving touch. You are right to tell you daughter that her personal space is her own. You are right also to tell family and friends her personal space is her own. We all need to speak up! I loved your post. I think you have done a wonderful thing here with this! More parents should follow suit. I have been thinking about this. I live in a culture where people believe that if they see something they like and they don't touch it, something bad will happen to it. For instance, when they admire my little girl, they think the need to touch her to keep her from getting sick. They touch her all the time, if I tell them no, they get very upset. A little while ago, she bit one of these people and they expected me to reprimand her. When I told them that they shouldn't have touched her, if they didn't want a reaction from her, they were furious with me. I don't condone her biting people but I felt that if they are going to touch her face and even her lips that they should expect to get bit. I wish I could figure out how to get these people to stop touching my child. I'm glad you are "that" mom too! She will grow up to be a confident adult and I wish more parents were like you. 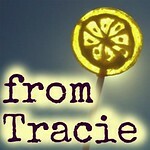 I'm so glad you are sharing this important message with your readers, Tracie. 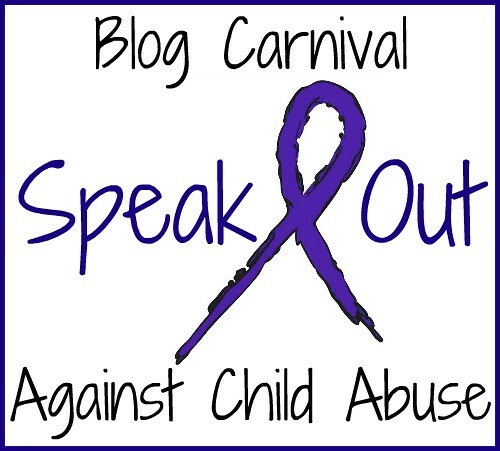 And thanks for letting us share it through THE BLOG CARNIVAL AGAINST CHILD ABUSE. You rock! Great post! I think it's incredible that you're giving your child a voice. I'm not a mom yet, but I think what you're doing is wonderful! I think it's also important to note that this exact technique might not work with every kid...but the motivation is extremly important. And as long as this technique is working for you and your daughter I say "Great!". Good parenting method to make kids protect themselves from the predators. Kids should know when to say "No" to anybody trying to take advantage of them. I think, everybody should learn to say "no" and learn to protect ourselves. Many of the adults find it difficult to say "no" to the demands of their abusive partners or bosses, because of their childhood training to be obedient and leave it to God. Every parent must teach their kids the same way you teach your daughter. You are doing a good job. I'm so glad I read this. You are doing a fabulous job teaching her to stand up for herself. This is a different world than even ours was as kids and children have to be more assertive. It could save their lives. I have a kid who says "no" frequently, in addition to asking "Why?" We are long past the good touch/bad touch age, but he still exercises those words regularly. It's interesting that so many people feel saying "no" to adults in any environment is disrespectful to adults. I have a kid who questions everything and everyone - even adults. YES YES YES!! I grew up in the deep south, where "yes ma'am/sir" is the end-all, be-all. It's how the people who abused me were so successful at it. Not only should you teach your children to say "no" to adults, adults have absolutely NO business demanding children give them hugs/kisses/love/touches of any kind. Adults should ALWAYS ask permission, and let the child know that "no" won't hurt the adult's feelings. Puts that power where it belongs - with the child! Another very important thing I talk my children - something that terrorized me as a child - was an adult saying "And don't you tell your parents because _________." I instructed them that it was WRONG for an adult tell a child to keep a secret from a parent and they should inform another adult, if not me or dad, as soon as possible, so we could handle the situation. It was OUR job to deal with this adult - whatever they were saying. This key piece of advice has prevented 3 attacks on my son and daughter - before 4th grade. It had a school counselor identified and removed. My children have always had permission to leave a classroom if they felt threatened. They are to report immediately to the nurse or the administrators office. And those people were always informed in advance. Their doors were open to help my children and any others feel safe. My son only used it once - and it was due to severe bullying - verbal - but that is another story. Having a safety net, a plan of action in the event of an emergency is a wonderful thing. We need to give our children a voice. They can be heard and still be accomplished, respectable students - with better odds of avoiding what so many of us did not. I really agree with you about the boundaries. I am not sure that I agree with you about telling a kid not to obey a teacher... I am a teacher, and when I am with children or young people, I have (temporarily) the same responsibilities that a parent has: to keep them safe, to direct them, to set boundaries, to teach, to feed them, etc. etc. How can a teacher be responsible for kids if parents are telling kids they don't have to obey them? Try conducting a class when 30% of the kids have the idea that the teacher's word is the same as anybody else's out on the street. What is happening is that, because of lack of teacher and adult control, young people end up abusing EACH OTHER: verbally, physically, and by interfering with others' education. Walk a mile in my shoes, and you will see what happens when you "throw the baby out with the bathwater." Boundaries, yes. Telling them they don't have to obey.....ummm.....have you ever tried being the teacher in that situation? If your child had never gotten a bad report, it's a good sign, but not sure it would work as a general rule. I understand what you are saying, Diane. And I know I didn't cover this enough in my original post (although I did touch on it in the comments) that we had definitely discussions about what is expected in a classroom setting, and how those set rules are not negotiable. The main point is to empower my daughter to be able to say no, even to an adult who is in charge, if something wrong is happening. Kids are smart enough to understand appropriate behavior in a classroom setting while still having enough control over their own person to say no or leave if something wrong, threatening, or unsafe is happening. This isn't just an issue of touch. As a world, we should learn to respect others' boundaries. It goes beyond sexual harassment at any age and to respecting others' boundaries in every way. Yes, CS. I completely agree!